King Mackerel, also known as Kingfish, are one of the largest representatives of the Mackerel family and are found in the western Atlantic Ocean. Common from North Carolina to Brazil, they are a popular sport fish that are the target of a number of tournaments in various countries. They are found both inshore and offshore, out to a depth of about 600 feet (but more commonly in 50-150 feet). They are migratory, so in some areas they are abundant at certain times of the year and completely absent at other times. As juveniles, they are often mistaken for other types of Mackerels. 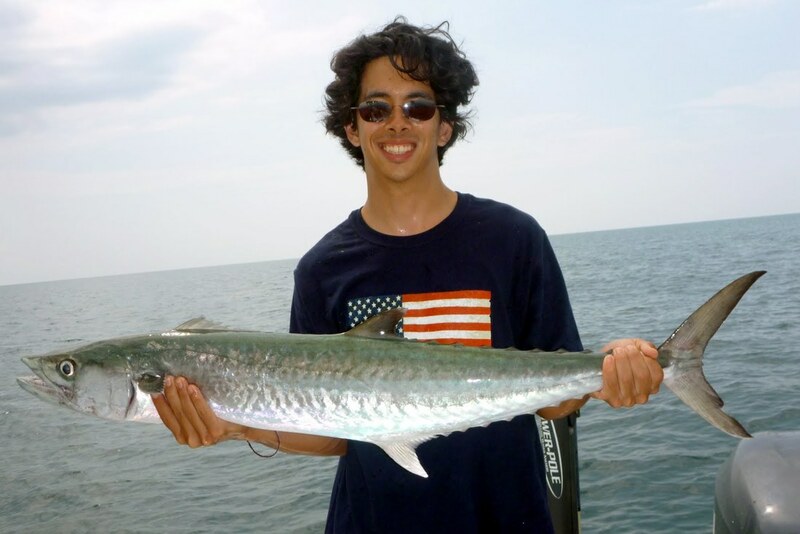 King Mackerel travel in schools and when you find one the action can be fast and furious. King Mackerel grow up to about 90lbs although they are usually much smaller than that. Females get much larger than males, and any fish larger than 15lbs is probably a female. They are very tasty and are targeted commercially for that reason. They can inflict a nasty bite with their teeth so watch your toes when you bring them on deck. These fish require a lot of line (especially the larger ones) since they take off on some blistering runs. However, they don't go into the rocks so you don't need super heavy line. Most King Mackerel are taken on trolling gear. Click here for tackle recommendations. 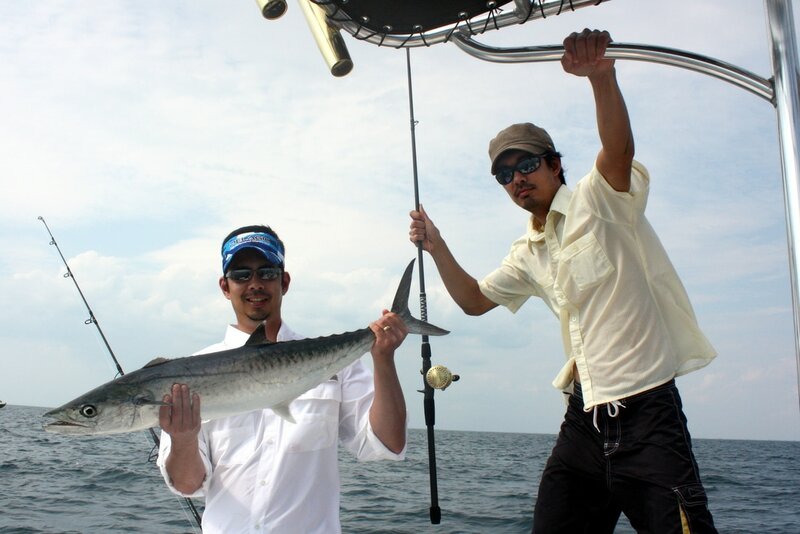 Most King Mackerel are caught by trolling. If using live bait, you should troll pretty slow. If using lures, you can troll faster. Like many members of the Mackerel family, they often bite the tail, so if you are using a bait make sure you have a hook in back as well as in front. Like all Mackerel, they have an annoying combination of good eyesight and sharp teeth. That means that if you don't fish them with a wire leader you stand a good chance of getting cut off, but if you use a wire leader they are less likely to bite. They often bite the back of a lure, so sometimes you get lucky and they miss the teeth, but most people use the lightest wire they think they can get away with based on water clarity. For the big ones, you might be able to go up to 90lb wire if the water isn't very clear. 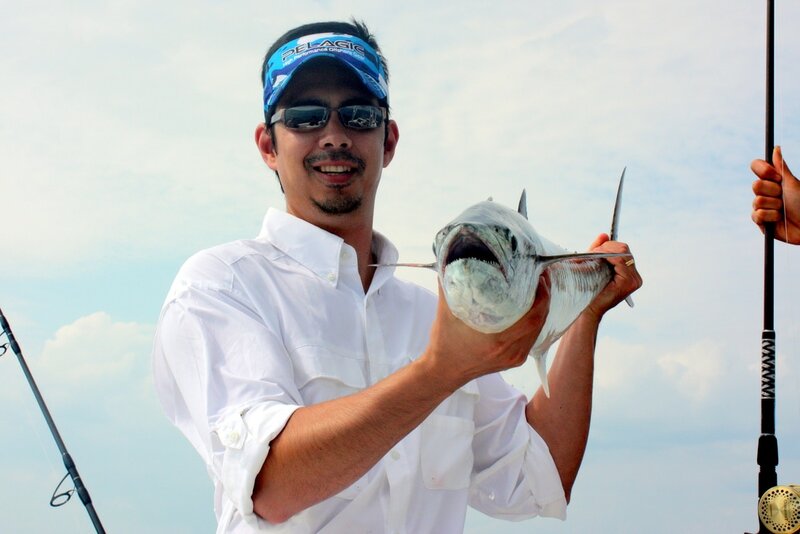 Most people target King Mackerel with live bait, but they are sometimes caught on lures. I have never targeted them this way, but you can try trolling shiny spoons or cedar plugs at much higher speeds than you would employ when fishing with bait. A wide variety of baitfish including pogies, blue runners, sardines, and smaller Mackerels will work for King Mackerel. Blue runners in particular are excellent because they are hardy. Troll them slowly in likely areas and make sure you have a hook in the back of your bait as well as the front since they often strike the back of the bait. Kingfish will feed on a variety of baitfish depending on what is in the area. In general, the bigger the bait the bigger the fish you will get. Big King Mackerel like big baits. The livelier, the better. Big King Mackerel tend to come to the same areas year after year. Many big ones are caught off of Texas, Louisiana, and Florida. 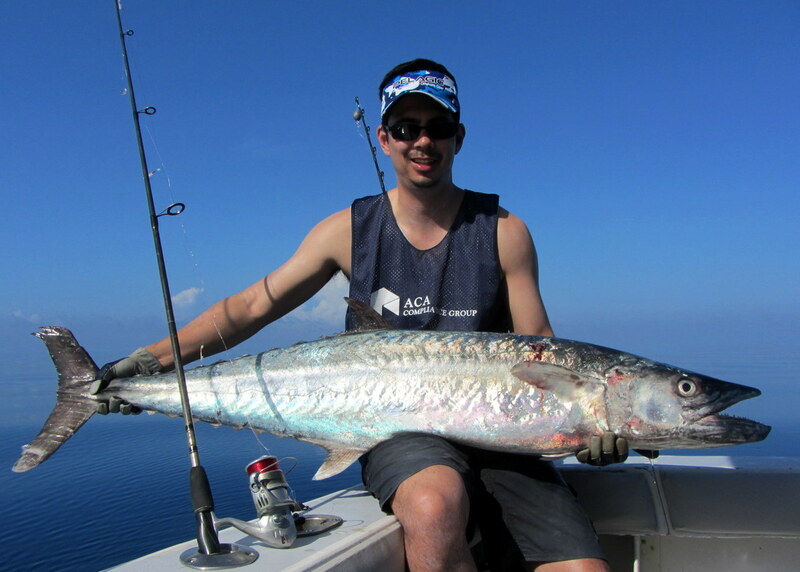 Another nice school-sized King Mackerel caught by the author's brother by slow-trolling a live bait. King Mackerel's mouths are packed with small razor-sharp teeth.